Heart can reveal Edinburgh Tram drivers have been warned about safety following the Croydon disaster. 7 people were killed when a tram overturned last week. It was one of the worst transport tragedies in recent years. The Rail Accident Investigation Branch found that the tram was travelling at 43mph, while the section of track had a speed limit of just 12mph. The tram derailed and overturned as it approached Sandilands Junction at 6.07am on Wednesday 9th November. The investigation has found no evidence of track defects or a malfunction of the tram's braking system. 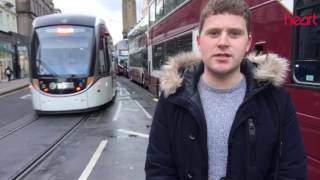 Bosses of the trams in Edinburgh have warned its drivers about the rule book and speed. Officials say they have an outstanding safety record in Edinburgh and this week's advice was just a reminder.